The other day I found myself explaining all of the steps to make a mug. Just a simple mug that is created using a potter’s wheel. 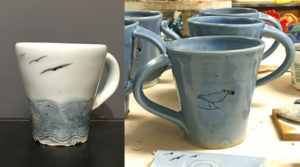 I make my mugs using porcelain that is white when fired in a reduction gas kiln. 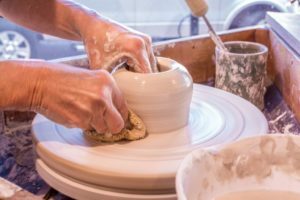 Before throwing on the potter’s wheel. I run clay through my pug mill. This softens the clay, aligns molecules, and gets it ready for making pots. I wedge 1 and a quarter pound clay balls. Wedging is like kneading bread. Well prepared clay makes throwing on the wheel, much easier for the potter. So, first you need to center the clay. I can remember years ago thinking that I would never get the hang of it. But, with practice and pure stubbornness, I learned this skill. With the clay centered, now you can insert your thumb or fingers to create the initial hole in the center. You will learn how far to go down through years of practice. Beginning potter’s will stop and use a pin tool to measure the thickness of the bottom. Your clay will shrink between 11 and 13% so that needs to be considered while making. Now you pull up the mug’s wall. The goal is get the height of your mug within three attempts. With Coleman porcelain, over-handling it will increase your chances of NOT being successful in your final product. 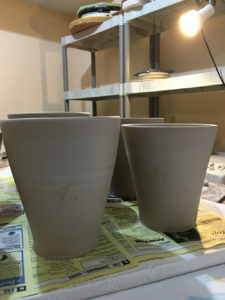 With practice, your mug’s walls will be the same thickness top to bottom. Consideration to the thickness of your rim must also be made. With functional pottery, you always want to think of the end user. When throwing my mugs, I like them to be six inches tall and about 4 inches wide. Remember, after firing your mug in two different kiln firing cycles, it will shrink approximately 12%. My mug will be approximately 3 1/2 inches across and 5 1/2 inches tall when finished. Consideration to its shape must be made during and after you have pulled the walls up to the height that you desire. I like simple mugs, fairly straight sides with a more narrow base. I like to roll a handmade stamp around the bottom third of the mug that relates to our moving sands or water currents. All of the thrown mugs are covered in plastic and set aside for a day. In a perfect world, I would pull handles the next day (think milking a cow), let them set up just a bit and then attach to the body of the cup. The goal is a handle that is the appropriate width for the shape and height of the mug. Handmade mugs need to be picked up and held. Each person likes to hold their mug in a certain way. Personal taste regarding the size and shape of a mug is as varied as there are people in the world. When I am looking at mugs, I always pick them up, moving it from hand to hand, deciding how it feels to me. I like to use a chopstick to add detail to the bottom of the mug plus stamp my logo on the bottom of it. I turn the finished mugs upside down to dry, covered with an old sheet. About five days later, I take a sponge and smooth any rough spots and look at them one more time for any cracking or defects. I make sure that the rim where your lips will touch the mug is smooth and pleasing to the touch. Now, they will be loaded into my electric kiln for the bisque firing, about 1800 degrees fahrenheit. This is a 12 hour firing and another day of cooling. Glazing is next. If I rolled my currents roller around the bottom third of the mug, I will probably paint a thinned underglaze in wave like brush strokes around this section. I make all of my glazes from dry chemicals. Years of mixing these glazes allows for knowledge of what your work will look like when pulling it out of the kiln. Application of a glaze that uses our Lake Michigan sand is applied to this section. Poured celadon glaze in a blue or green will go on the inside and outside of the top two thirds. These areas will be glazed twice for good coverage of the celadon glaze. It takes about three weeks of solid work to fill my reduction kiln. When there is enough work to fill it, then I will fire. The gas kiln is fired over a day and a half. I light it around 8pm on the first night. I go to bed when it is about 600 degrees around 11pm. A few adjustments are made during these three hours. The next morning around 6am, I adjust the burners, air, and damper. Many adjustments take place through the next 8-10 hours. Ultimately, I am looking for my kiln to reach about 2350 degrees or Cone 10. We use engineered cones inside of our kiln to determine what is really happening inside it over time. Then, we wait for two days, letting it cool slowly. With experience, there shouldn’t be too many surprises with the opening of the kiln door. Maybe some “Wow! that glaze really looks good this time.” Hopefully, nothing needs to have a hammer taken to it. Slight grinding of the bottoms and off to the gallery or another business.